In the distant future, humanity has been separated into two groups: The "Pure Race", normal people, and the "Nano Race", people who have been given special powers through gene modification with nanomachines. Suppressed by the Pure Race, they are forced to make no use of these gifts in their world. But the bravest and strongest, the Magicicada Hunters, travel through parallel worlds, in search for their multi-legged prey. So does the young Beck. Together with his partner Tyger, he is trying to collect the money for the removal of the nanomachines. 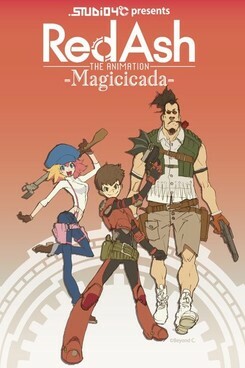 Initially a crowdfunding campaign for a film about the game of the same name, Red Ash was eventually released as a part of the Anime Tamago project. Anime Tamago, or Young Animator Training Project, is an initiative of the Japanese government, which has set itself the task of financing projects for training young - here 3D - animators. In the case of Red Ash this took place at the renowned "Experimentalstudio" 4°C, which is also responsible for works like Mind Game or Tekkonkinkreet. Red Ash wurde auf dem 19. JFFH 2018 gezeigt.